With the Key Performance Indicators gadget in the Business Analyst portal, you can establish and monitor key performance indicators (KPIs) for the current application, see real-time KPI results using gauge-style charts, and analyze trends over time. The KPIs gadget leverages the Key Performance Indicator (KPI) Framework. When the KPI Framework is installed and configured for your application, you can work with and view business KPIs directly within this gadget. The functions available within the Business Analyst portal are identical to those available in the KPI Framework. You can create new KPIs and schedule them for periodic runs, create trend reports, and view KPI results. Obtain the KPI Framework package. Install the framework database tables and import the framework RuleSets. Restart your application and verify the framework installation. Note: The installation steps described here can be performed to install the KPI Framework on a Version 6.1, 6.1 SP1, or 6.1 SP2 system. 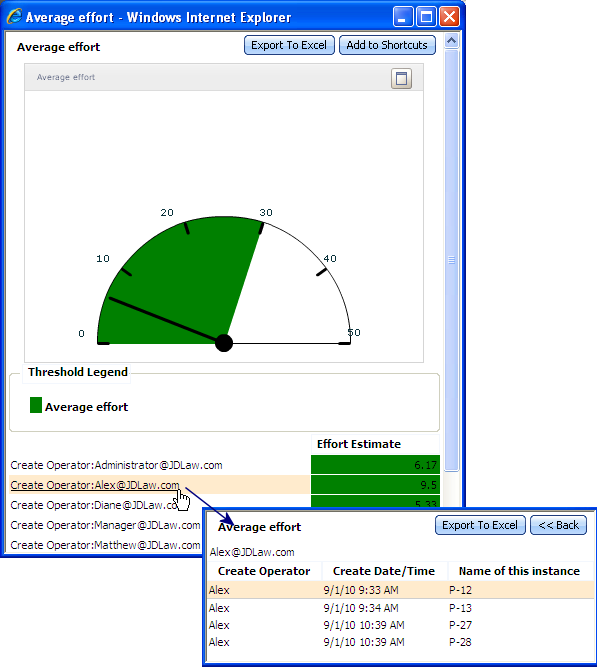 The Business Analyst portal is available in a Version 6.1 SP2 system only. Installation of the database tables must be performed by a person with authority to create tables in the PegaRULES database for your installed system. Import of the RuleSets must be performed by a person who has the privileges to import rules into your Process Commander system (such as those privileges provided by the standard PegaRULES:SysAdm4 or PegaRULES:SysArch4 access roles). The KPI Framework is one of the Productivity Solutions available for PRPC. To obtain the framework, contact your Pegasystems Sales representative. Before installing the KPI Framework, verify you have a Process Commander V6.1 system installed, and that the installed Pega-ProcessCommander RuleSet version is not lower than 06-01-01. Note: While you can use the installation steps to install the KPI Framework into a Version 6.1, 6.1 SP1, or 6.1 SP2 system, the Business Analyst portal is only available for a Version 6.1 SP2 system. To install the database tables, you run a script that creates the KPI database tables in the PegaRULES database for your Process Commander system. These steps must be performed by a person with authority to create tables in the PegaRULES database for your installed system. Connect to the PegaRULES database for the Process Commander system into which you are installing the framework for use with the Business Analyst portal. Using the database tool of your choice, load and run the SQL script file appropriate for your database type. The files are located on the KPI Framework media, with a file for each database type. Run the script that corresponds to your database type. Next, you import the framework RuleSets. These steps must be performed by a person who has the privileges to import rules into your Process Commander system (such as those privileges provided by the standard PegaRULES:SysAdm4 or PegaRULES:SysArch4 access roles). Choose the RuleSet package appropriate for the type of system you are installing into: a Process Commander system or into Customer Process Manager (CPM). First import the KPI Framework 7.1 RuleSets. Then, using the same steps, import the PegaKPI_6.1_Patch.zip package. The PegaKPI_6.1_Patch.zip package contains the RuleSet required for using the KPI Framework RuleSets in a Process Commander Version 6.1 SP2 system. Log into the Process Commander system. In the Select Import Mode box, select Local Zip File. 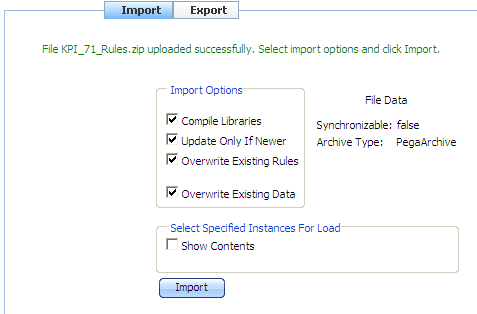 After the selected zip file is uploaded, the system displays import options. In the Import Options section, make sure the Compile Libraries, Update Only If Newer, Overwrite Existing Rules, and Overwrite Existing Data checkboxes are selected. Click Importto import the contents. If a warning appears about a missing required prerequisite, click OK to ignore it and continue with the import. Click to refresh the Import gadget and repeat steps 3 through 8 with file PegaKPI_6.1_Patch.zip. In this step, you stop and restart the prweb application, log in, and verify that the appropriate framework RuleSets and versions are installed. Using the tools for your web application server, stop the prweb application and restart it. This enables the system to pick up all of the changes made in step 3. In this step, you update your application rule to include the appropriate RuleSets from the KPI Framework, and add the appropriate RuleSet as a prerequisite to any RuleSet in which you intend to save KPI definitions. Open the application rule by selecting Application from your profile menu. Save the updated application rule. Add the PegaKPI:07-01-02 RuleSet as a prerequisite to any custom RuleSet in which you intend to save created KPI definitions. Log out of the system and log back in so that your profile picks up the changes before continuing with Step 2. In this step, you add the KPI-Process work pool and the appropriate KPI role to your access group. Open your access group by selecting Access Group from your profile menu. 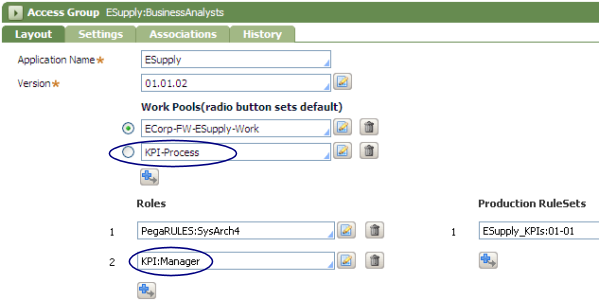 Add KPI-Process to the Work Pools array. To be able to create and work with your own KPIs, select KPI:Manager . This is the typical choice. To be able to see all KPIs created for the application, even by other operators, as well as create and work with your own KPIs, select KPI:SysAdmin . Save the updated access group. Log out of the system and log back in so that your profile picks up the changes. 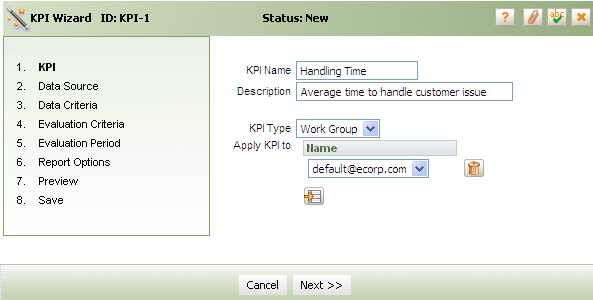 If the KPIs gadget does not display the New button, check the following items and take the corresponding action. Update your access group to add the required KPI work pool and role. Log out and back in to apply the changes. The KPIs gadget displays a message about getting the framework. 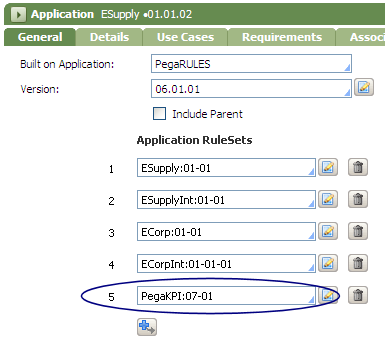 Occurs when the application rule does not have the PegaKPI RuleSet in the Application RuleSets array Update your application to add the required RuleSet. Log out and back in to apply the changes. Occurs when your access group has the KPI:User role in the Roles array instead of KPI:Manager or KPI:SysAdmin Update your access group to select the KPI:Manager role. Log out and back in to apply the changes. To enable the KPI Framework to send emails with KPI results, the standard KPI-Process outbound email account must be configured. This step must be performed by an operator who has access to log into the Designer Studio (someone whose access group specifies the Developer portal rule). Log into the Designer Studio. 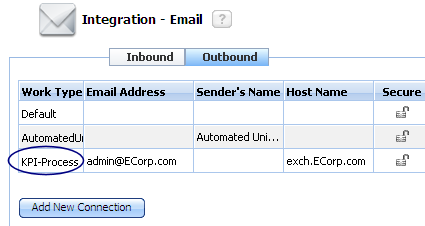 Click the Pega button ( ) and select Integration > Email > Outbound Email. 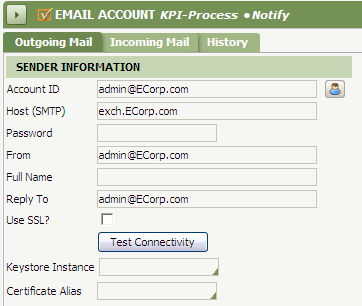 Click KPI-Process to open the Email Account form. Enter the email information appropriate for your organization and save the form. To create a new KPI, click Newon the KPI gadget. The KPI wizard opens and guides you step-by-step through the process of creating a new KPI. KPI: Enter a name and description for this KPI, and select what it is evaluating (like a user or a work group). Data Source: Select which of the application's work types to evaluate. Data Criteria: Specify selection criteria for the data you want used for this KPI. For example, you can specify the KPI should use records where the resolution time is greater than 48 hours. Evaluation Criteria: Specify the KPI evaluation criteria and threshold values. Depending on your site's configuration of KPI actions, you can optionally specify an action the system should take if the threshold is met. Evaluation Period: Select whether to be able to preview the KPI and whether to schedule it to run periodically. Report options: Select the type of gauge/meter chart to use and whether to create trend reports for this KPI. Report Drill Down options: Available only for previewed KPIs (not scheduled KPIs). Specify data fields to drill down into from the preview KPI report. Distribution: Optionally select system users or email addresses to receive notification when this KPI's thresholds are met. Preview: In this step, you can preview the KPI results and chart format selected in the Report Options step. 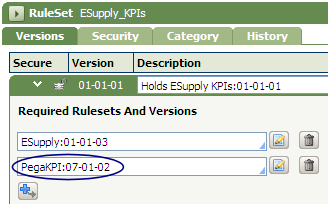 Save: Specify the RuleSet name and version in which to save the KPI definition. This RuleSet must have PegaKPI:07-01 as a prerequisite. Once the KPI definition is saved at the end of the wizard, close the wizard. To see the newly created KPI on the KPIs gadget, click to refresh the home display and see the KPI. For detailed information about each step of the KPI wizard, see the KPI Framework User and Implementation Guide. View KPI results from scheduled runs Click to view the KPI results collected to date. Available for KPIs that are scheduled to run on a periodic basis. Preview KPI Click to present an ad-hoc evaluation based on past work object data. Available for KPIs whose definitions allow preview. Show historical trend Click to display trend reports for this KPI. Available for KPIs whose definitions specify trend report creation. Modify the KPI definition or withdraw it from use Click to modify the definition for this KPI or withdraw the KPI from use. The following image shows KPIs that have previews available, are scheduled to run, and have at least one prior run. Click to view the results for prior runs of that KPI. The icon is available if the KPI is scheduled to run periodically and if there are results available (has run at least once). When you click the icon, a window displays the KPI results for the most recent run. Use the Available Resultsfield to view results for previous runs. Click to preview results based on the current system data. When you click the icon, a window displays and you can view summary data (as in the Results window) and also drill-down report details. The icon is available if the KPI was defined to allow for preview functions when it was created. Click to display the trend report for the KPI. The icon is available if the KPI was defined for trend reporting. Make a copy of this KPI — Select this choice to create a new KPI using the current KPI definition as a starting point. Update this KPI — Select this choice to update the definition of this KPI. After clicking Submit, the KPI wizard opens for you to make changes to the KPI definition. Some values cannot be changed: the KPI target, data source, or data criteria values. If you want to modify one of those values, withdraw the existing KPI and create a new one. Withdraw this KPI — Withdraws the KPI from use, preventing future runs, and resolves the KPI work object (puts it into Resolved-Withdrawn status). 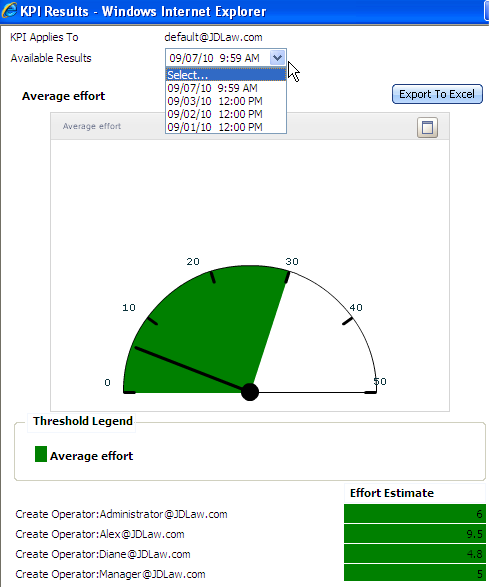 Withdrawn KPIs are not displayed in the KPIs gadget in the portal.